Wärtsilä and Viking Line signed an Optimized Maintenance agreement for the Wärtsilä LNGPac system onboard passenger ferry Viking Grace, significant in that it is the first Optimized Maintenance agreement ever made for Wärtsilä LNGPac, a complete gas handling system for ships fueled by liquefied natural gas (LNG). Viking Grace was the first passenger ferry to useLNG as a fuel source. The agreement also includes Condition Based Maintenance (CBM) and online support for the Wärtsilä LNGPac system. Additionally, Wärtsilä extends its existing Optimized Maintenance agreement for Viking Line’s Viking Grace ferry for another five years. The Optimized Maintenance agreement, signed in late 2017, enables the planning and scheduling of Viking Grace’s maintenance procedures to suit the ship owner’s business operations, thus improving their long-term cost predictability. It also increases performance reliability and maximizes the vessel’s uptime, benefiting the vessel’s owner as well as its passengers. A new feature for the LNGPac agreement is Wärtsilä’s Condition Based Maintenance system that gathers information on the average gas flow, the temperatures of the heat exchangers, the use of energy, and the pressure of the LNG pumps. The data helps in planning and scheduling the above-mentioned maintenance procedures that improve cost predictability and uptime. Wärtsilä LNGPac is a complete fuel gas handling system for LNG fuelled ships. On Viking Grace, it comprises onboard liquid natural gas bunkering, two storage tanks, and handling equipment with related safety and automation systems that have been developed by Wärtsilä. In addition to Wärtsilä LNGPac, Wärtsilä has delivered four Wärtsilä 50DF main engines running on LNG, the transverse bow and stern tunnel thrusters, two stainless steel fixed pitch, built-up main propellers with complete propeller shaft lines and environmentally sound shaft line seal systems to Viking Grace. Since Viking Grace was taken into operation in 2013, Wärtsilä has been in charge of its maintenance. 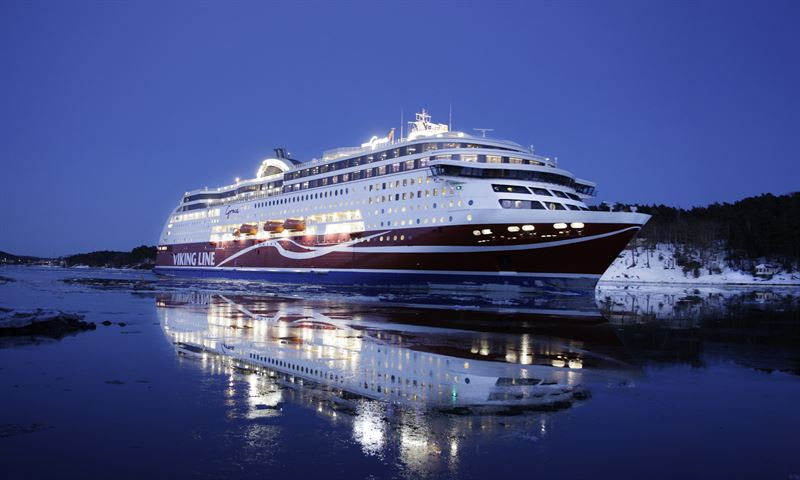 In February 2018, Wärtsilä and Viking Line agreed on the extension of the Optimized Maintenance agreement for Viking Grace, covering both CBM and online support, for another five years.